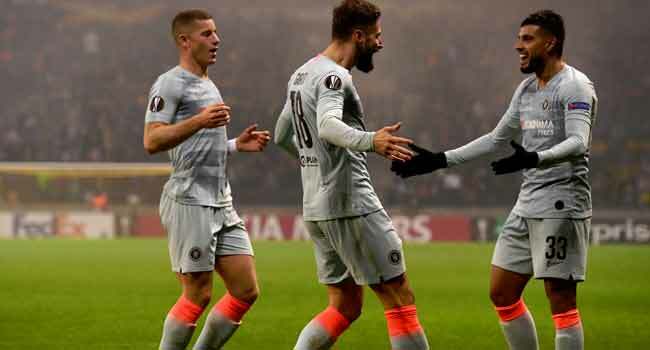 Chelsea booked their place in the Europa League knockout stage as Olivier Giroud’s first club goal of the campaign gave Maurizio Sarri’s men a 1-0 win at BATE Borisov, while Rangers lost a seven-goal thriller against Spartak Moscow. The hosts almost levelled just five minutes later, as they hit the woodwork for the second time in the match when Nikolai Signevich diverted the ball onto the crossbar. Rangers’ Scottish goalkeeper Allan McGregor concedes a goal during the UEFA Europa League group G football match between FC Spartak Moscow and Rangers FC in Moscow on November 8, 2018.